Protected Use - Kiosk Applications | MaxBotix Inc. The advanced filtering in the MaxSonar sensors that have been recommended for kiosk applications includes the ability to operate with multiple sensors simultaneously. The filtering is also preprogrammed with trigger distances to ensure the kiosk only acts when a person is within a certain distance. This allows the kiosk to operate reliably, even when multiple kiosks are setup in the same environment. 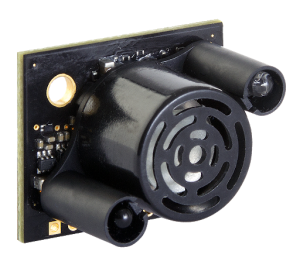 The ProxSonar-EZ ultrasonic proximity sensors have pre-programmed detection distances of 1ft, 2ft, 3ft, 5ft, or 7ft. This means that whenever a person is within the detection distance, the sensor will output a digital high signal. When there are no detectable targets within the detection zone, the sensor outputs a digital low signal. Simply choose the sensor with the detection zone that is desired distance you require for your kiosk. If you need a specific trigger distance that is not provided, please contact us about a semi-custom version.